A number of Central American migrants, after an exhausting months-long journey across Mexico as part of a caravan of thousands, have attempted to illegally enter the United States, according to Reuters. It is believed desperation drove about two dozen migrants on Dec. 3 to jump a 10-foot fence from Tijuana, Baja California, just south of San Diego, Calif., where Border Patrol immediately apprehended them. Whether they cross illegally or through a port of entry, asylum seekers are facing tough odds, according to a new report from Syracuse University. Immigration judges denied a record number of asylum claims in the fiscal year of 2018. Last year, judges decided 42,224 cases, a sum that exceeds 2017’s tally by 40 percent. It can take years for an asylum case to be heard in court, and most of the cases in question involved applicants who arrived well before President Donald Trump took office. This year, judges denied asylum in 65 percent of such cases, marking the sixth year in a row that denial rates have increased. Immigration judges denied a record number of asylum claims in the fiscal year of 2018. The Nov. 29 report comes weeks after a caravan of thousands of Central Americans arrived in Tijuana, Baja California. Many from the caravan joined more than 3,000 who were already waiting to have their asylum cases heard at the San Ysidro Port of Entry. “Overall, asylum denial rates have skyrocketed,” according to Victoria Neilson, a senior attorney at the Catholic Legal Immigration Network, Inc. According to the report, the increase in denial rates is not related to immigrants not showing up for court dates. Immigrants were present in court for more than 98 percent of asylum decisions. 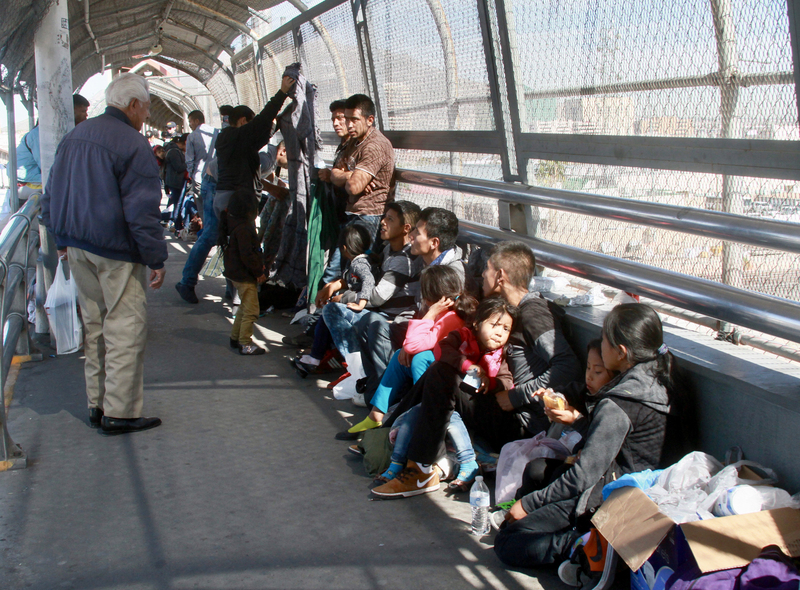 It already takes months to file an asylum claim with U.S. officials at ports of entry along the U.S.-Mexico border, including in Tijuana, Nogales, Sonora and Nuevo Laredo, Tamaulipas. With the new influx of immigrants, and potentially thousands more on the way, the wait will only get longer. In the end, a majority of the applications may be in vain. As attorney general, Jeff Sessions had encouraged immigration judges to decide cases more quickly, she said. The recent Syracuse University report signals that this has happened. The Trump administration’s efforts to limit immigration, both legal and illegal, have been met with mixed reactions. Mr. Sessions implemented a “zero-tolerance” immigration enforcement policy in May, which led to the separation of thousands of immigrant families at the border. Under the policy, the U.S. government would prosecute everyone who crossed the border illegally, including asylum seekers. In June, the former attorney general tightened the grounds on which immigration judges could grant asylum, a move that led to an increase in denial rates, according to the Syracuse University study. Last month, the Trump administration attempted to circumvent laws that allow migrants to apply for asylum, independent of how they arrive to the United States. A judge blocked the effort, though, arguing that the administration’s order contradicts existing U.S. immigration law. The Trump administration’s efforts to limit immigration, both legal and illegal, have been met with mixed reactions. Matt Suissis of the Center for Immigration Studies, a group that favors policies that admit fewer immigrants, could be described as more of a supporter. Syracuse University reported in June that less than 15 percent of asylum seekers passed credible fear reviews during the first six months of 2018. What he referred to as “legitimate asylum claims” need to be prioritized over others. Part of the problem, Mr. Suissis said, is that the definition of “asylum seeker” has been expanded beyond the original intent. Individuals can seek asylum in the United States when they have suffered persecution or fear that they will suffer persecution due to race, religion, nationality, membership in a particular social group or because of their political opinion, according to U.S. Citizenship and Immigration Services. Like the Trump administration, Mr. Suissis does not believe “membership in a particular social group” should apply to those fleeing from gang violence. He also believes migrants are coached by legal experts to apply for asylum instead of other means to obtain legal immigration, like a work visa, that might better reflect their actual circumstance. “We can’t take people because of their economic situation,” Mr. Suissis said. But Ms. Neilson said such cases have nothing to do with asylum. “If someone is an economic migrant, they’re not going to get past the credible fear interview,” she said. Establishing “credible fear” is the first step in the asylum process. Credible fear interviews can last more than two hours, Ms. Neilson said. Syracuse University reported in June that less than 15 percent of asylum seekers passed credible fear reviews during the first six months of 2018. If migrants fail their credible fear interview, they are placed on “expedited removal,” and deported to their home countries. The city of Tijuana had been sheltering an estimated 6,000 migrants from the caravan in a sports arena near the U.S.-Mexico border. If they do pass their credible fear screening, migrants will then have their case heard by an immigration judge. Some are detained until their case is heard, others are released with ankle monitors and others are released on bond, according to Ms. Neilson. If they are released, migrants will often travel to other states where they have family. They may be released without a court date, so they must call an 800 number to find out where and when their case will be heard. If they want to get their hearing scheduled nearby, there is a process for that, Ms. Neilson said, but it is complicated. Though few in number, some migrants that have passed their credible fear screening interview do not show up for their court hearing. A report from CLINIC earlier this year listed a number of reasons for that, including that migrants were not notified of the court date, that they received the wrong court date or that they had incorrect information about how to represent themselves. Some, like Mr. Suissis, believe that migrants seeking asylum are exploiting immigration “loopholes.” He described the ability to claim asylum as a “pull” factor that is bringing thousands to the U.S. border. But Ms. Neilson’s experience is different. The city of Tijuana had been sheltering an estimated 6,000 migrants from the caravan in a sports arena near the U.S.-Mexico border. But muddy terrain, illness and poor living conditions led officials to move the migrants to a new facility run by federal authorities 10 miles south, Newsweek reports. Secretary of State Mike Pompeo announced that the number of refugees allowed into the United States this coming year will be 30,000, the lowest number in nearly four decades. Many of the migrants in the caravan may not be fully aware of the likelihood that they will be deported back to their home countries, given that only 15 percent pass the initial credible fear review. Of those who do pass, roughly 35 percent are granted asylum. Since 2014, the United States has been facing an influx of immigrants from Central America, particularly women and children. They have been coming from an area known as the Northern Triangle—Guatemala, Honduras and El Salvador—which is beset by gang violence and homicides. Guatemala, for example, saw an average of 13 murders per day in 2015. Given the size of its population, Guatemala’s homicide rate is seven times that of the United States. El Salvador has a homicide rate that is 20 times that of the United States. From 2008 to 2015, the United Nations reported that asylum applications from Central America increased 13-fold. “If requesting asylum is a loophole, well, that’s a disturbing way to look at it,” said Donald M. Kerwin Jr., director of the Center for Migration Studies in New York. Kirstjen Nielsen, the U.S. Secretary of Homeland Security, among others in the Trump administration, has characterized Central Americans as uttering “magic words” when they claim “credible fear.” Ms. Nielsen also recently requested civilian law enforcement support on the border, according to Politico. The U.S. government currently spends around $4 billion annually on border security, compared to an estimated $180 million in foreign aid that is budgeted to be sent to Northern Triangle countries in 2019. In 2017, for example, the Department of Homeland Security ended the Central American Minors program, which offered vulnerable children from Central America a way to come to the United States. This past October, Secretary of State Mike Pompeo announced that the number of refugees allowed into the United States this coming year will be 30,000, the lowest number in nearly four decades. Last year, the Trump administration changed the threshold that establishes a “credible fear” justifying asylum status. According to CLINIC, asylum seekers now have to present a “preponderance of evidence” rather than simply a “significant possibility” to establish credible fear. The administration has also taken issue with the Flores settlement, which limits the time children can be kept in immigration detention. Even before President Trump, previous presidents had put into place tough regulations on immigration. Many of President Trump’s actions build upon the 1996 Illegal Immigration Reform and Immigrant Responsibility Act, Mr. Kerwin said, which was signed by President Bill Clinton. Mr. Clinton, reversing a campaign promise, also intercepted asylum seekers from Haiti and returned them to their home country. President George W. Bush signed the Secure the Fence Act of 2006 and President Barack Obama deported 2.5 million immigrants, including more than 434,000 in 2013. Immigration enforcement officials were also separating families before this year’s zero-tolerance policy, Mr. Kerwin noted. Nevertheless, he said the Trump administration has put into place fairly significant changes. “They want to detain people and they want to deter people from coming, but they don’t do anything to address root causes,” Mr. Kerwin said. The U.S. government currently spends around $4 billion annually on border security, compared to an estimated $180 million in foreign aid that is budgeted to be sent to Northern Triangle countries in 2019, according to Newsweek. “Some significant amount to help people stay at home seems to me to be the obvious solution, ” Mr. Kerwin said. Root causes? The last thing people want here is to fix the problem. It’s not entrance to the US or the US giving more money to any country that will fix the problems. Assume, for the sake of argument, that threat of domestic abuse or gang violence calls for humanitarian refuge. (Probably, then, at least 250 million people are entitled to humanitarian refuge.) Is it necessary to make a months-long journey the length of Mexico and reside in the United States to escape domestic abuse or gang violence? If not, what kind of case for asylum in the United States do these people have? What are their advocates saying? the last paragraph is the most significant--invest $$ in making living conditions better in the countries of origin--and also mount a publicity campaign to get the word out about the slim chances of getting approved for asylum at the US border. Maybe that will deter some of these very young mothers from taking their babies on a marathon. There seems to be a very BIG misinformation campaign going on south of the border. RE: "asylum seekers face setback at U.S. border"
Prayer can move mountains. Seek and you will find. Knock - and the door will be opened to you. This article also appeared in print, under the headline "Backlog at the border," in the January 7, 2019 issue.